This has been an INCREDIBLE week! 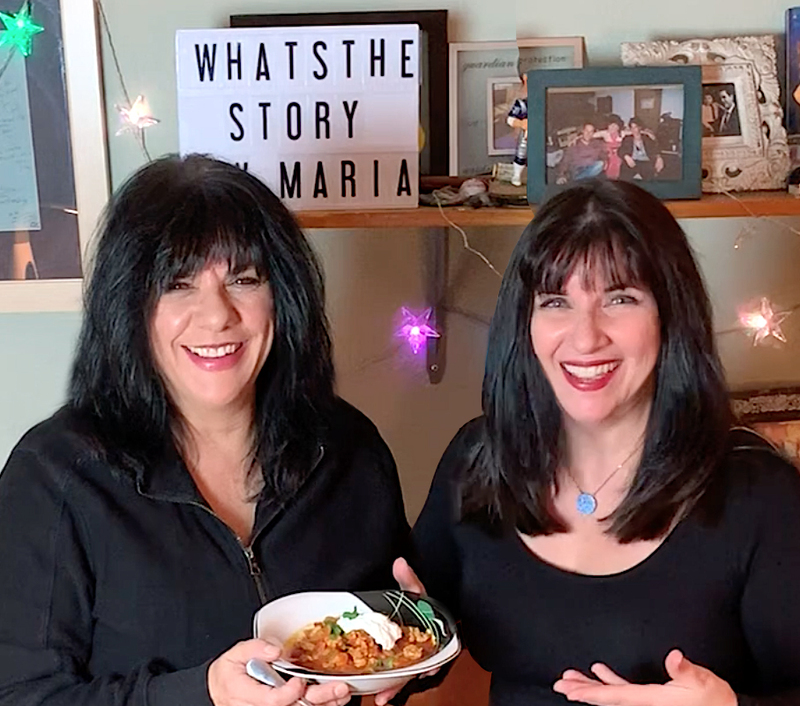 I had the distinct honor of being a guest on Episode 72 of the hit Facebook Live show “What’s the Story with Maria” starring the incomparable Maria Gentile! She interviews top personalities in entertainment and the arts LIVE from New York City! Talent personified having an interactive chat-0ut with more talent personified! Not only is it fun to watch, but it’s great to participate and be part of the conversation. Actually being a guest? Well… amazing! I was almost distracted by watching how skillfully she keeps the conversation going, the viewers engaged, and is aware of time and the requirements of her network and engineer. And what amps it all up even more? Her awesome segment, “G’Ahead, Keep Eatin'” where she introduces a meal she’s created for the evening. It cracks me up and is always a delicious entry into the conversation. I wanted to do something special for that segment to honor Maria and her show so I created a delightful dish. 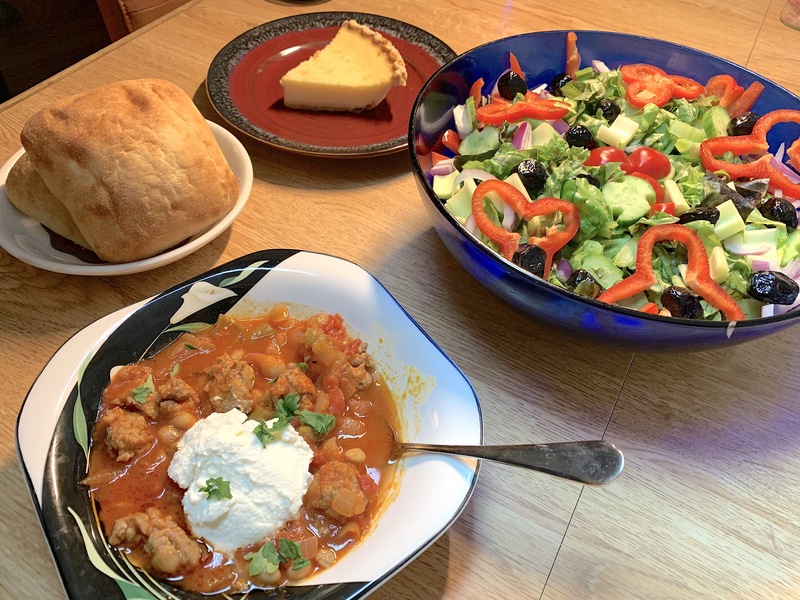 Maria often serves Italian food so I made Maria Gen-CHILI!!! It’s an Italian twist on the Mexican classic. Woo hoo! As you can see, it couldn’t be more easy to cook. 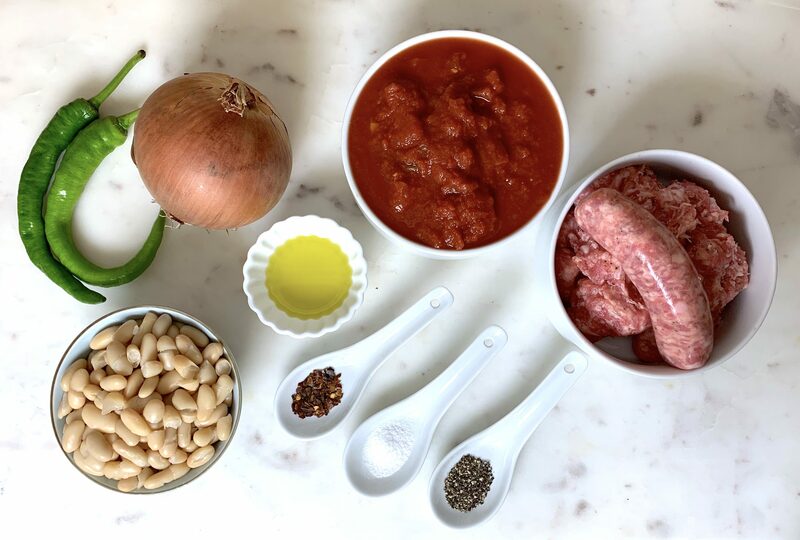 Sweet Italian sausage is so flavorful and removing the casings gives it a more crumbly texture that works beautifully in this stew-y dish. And speaking of a DISH, the other guest on the show was the amazing Dominick Pupa! I’d never met him before and now I’m so glad to be his friend. What a witty, handsome, talented entertainer! He’s got shows coming up – run, don ‘t walk to get your tickets!!! Chicago… Los Angeles… New York City! Yeah! And I think I see a Dominick “Zupa” (Italian soup, or zuppa) in this blog’s near future! Ha! Click here to see our episode! And please check out Maria’s site and Dominick’s site, AND make this dish! What’s the Story with Maria? The story is wonderful information and entertainment every Tuesday on Facebook at 9:00p. Hope to see you there! Heat olive oil in a large skillet over medium high heat and sauté onions for about 5 minutes. Add peppers and continue to cook another 5 minutes. Add sausage, using a spatula to break it up and mix, and cook until it browns, about 10 minutes. Mix in tomatoes, beans, and spices then cover and lower heat, cooking for about 10-15 minutes. Serve hot and garnish as desired. « Let’s Get Corny! Skillet Cornbread!